With Brexit in mind, just how long do trade deals take to agree? Back in April, President Barack Obama warned it could take the United Kingdom up to 10 years to negotiate trade deals with the US and that it would be at the “back of the queue” if it left the European Union. Now that Britain has voted Brexit, the UK government needs to renegotiate deals with the EU – and the bloc’s trading partners, including the United States. That’s over 50 countries. Trade deals have a reputation for being slow, drawn-out affairs – Canada took seven years to strike its agreement with the EU. So how long would a US-UK free trade deal really take? Perhaps data from previous US agreements could offer an insight. The Peterson Institute for International Economics (PIIE) has crunched the numbers on how long it has taken the US to agree 20 bilateral trade deals. The answer? One and a half years, on average. And more than three and a half years to get to the implementation stage. Negotiations with Jordan – the first Arab nation to have a free trade agreement with the US – took just four months, and the deal was implemented in a year and a half. At the other end of the scale is Panama. This deal took more than three years to agree and eight and a half years from launch to implementation. Negotiations were kicked off by former President George W Bush and concluded by President Obama. The hold-up was due to concerns about Panama’s labour practices and tax transparency, according to PIIE. Based on its sample of 20 deals, the institute identifies two factors that can speed up the negotiation process: a monarch and an election year. Four of the agreements took less than a year, three of which were with countries with monarchies: Bahrain, Jordan, and Oman. PIIE estimates that having a monarch cuts the time it takes to negotiate by about half. Agreements signed during a US presidential election year take about 40% less time than deals struck at other times. And more than half of US agreements were signed in election years. “This makes sense: negotiating presidents want to close agreements that they started, which will be part of their legacy,” say the authors, Caroline Freund and Christine McDaniel. It's one of the world's biggest trade deals and covers 40% of the global economy, so it's not surprising that the Trans-Pacific Partnership (TPP) has taken longer to negotiate than other US free trade agreements. Talks began in 2008 and the agreement was signed by 12 countries earlier this year, but ratification and implementation are thought to be unlikely before President Obama leaves office. The Transatlantic Trade and Investment Partnership (TTIP) currently being negotiated between the US and the EU would become the world’s largest trade agreement, covering 45% of global GDP. This was the trade deal that Obama was talking about when he said Britain would go to “the back of the queue”. 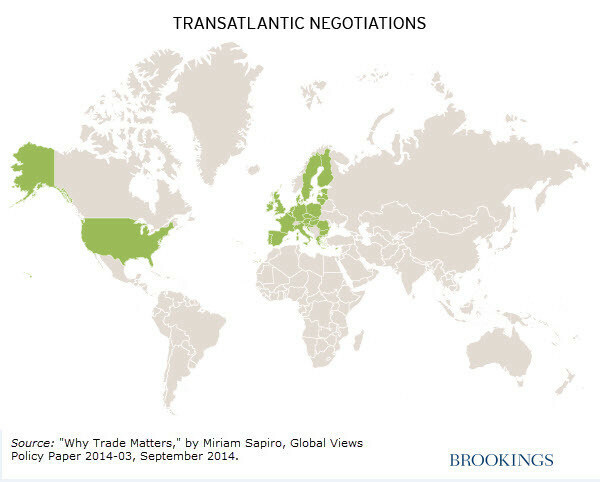 TTIP: What does it mean for the future of transatlantic trade?